Alex has had a lifelong commitment to local and community radio, which started at school when he took a leading part in the operation of a school recording studio, and later in a studio rebuilding, re-equipping and operation of a very successful hospital radio service in London. He also worked on a voluntary basis at several BBC Local Radio stations, and as a vacation engineer for BBC World Service while taking a degree in Electrical and Electronic Engineering at University College London. Alex spent 3 years as an audiovisual projects designer for the Natural History Museum in London. He then worked for the BBC for 20 years, initially as a special projects designer, and later as an IT Manager. Over his time with the BBC he was involved in many and varied projects in radio and TV. Alex is station manager and is also responsible for engineering matters at the station. 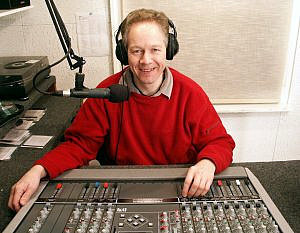 He presents 'Craic at Dawn' on Friday mornings from 7.30 to 9.00 am, which usually includes a live two-way link-up with the Big Breakfast Show on Cuillin FM in Portree.